BHAA 6K Combined XC Tymon Park - Civil Service Harriers A.C.
Congratulations to Eoin Devlin who finished third overall in the BHAA Bank of Ireland XC race in Tymon Park. Eoin ran a great race, leading for the first lap and only narrowly beaten into third place. Great running Eoin! 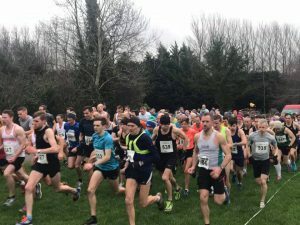 The club was out in force for this combined 6k race and put in some great performances, especially considering many had been racing hard at last week’s Masters race. Gareth was next home after Eoin, finishing in 23rd place. Eoin Kealy and Tibor Kulich weren’t far behind, in 25th and 26th place. The club dominated a lot of the age categories. 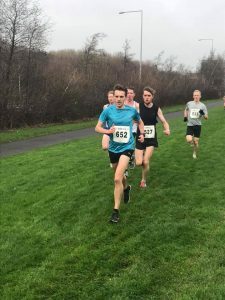 Dave Hipwell, Sean Ryan and Vincent O’Neill all finished second in their respective age catgories, while Billy Beausang finished third in his. Congratulations guys. Nick Devery and Christy Smith narrowly missed out on a prize in their category. Well done also to Paul Foran, Tony Garvin, Brian Corr and Joe Delaney who also ran on the day. Our ladies also had some great runs. Brid Ryan was fifth lady overall and first in her age category. Great running from Brid. Fiona Fagan finished third in her category and Emily Ennis was fourth in hers. Well done ladies. Well done also to Keith’s Parkrun group who had their first outing in St Anne’s Park last weekend and put in some great runs. The group will be heading to Poolbeg this Saturday. Plenty of racing options for people next weekend with another BHAA XC race in Ballyboden St Endas on Saturday and the club race on Sunday.